I love a tofu scramble. They’re so unassuming. 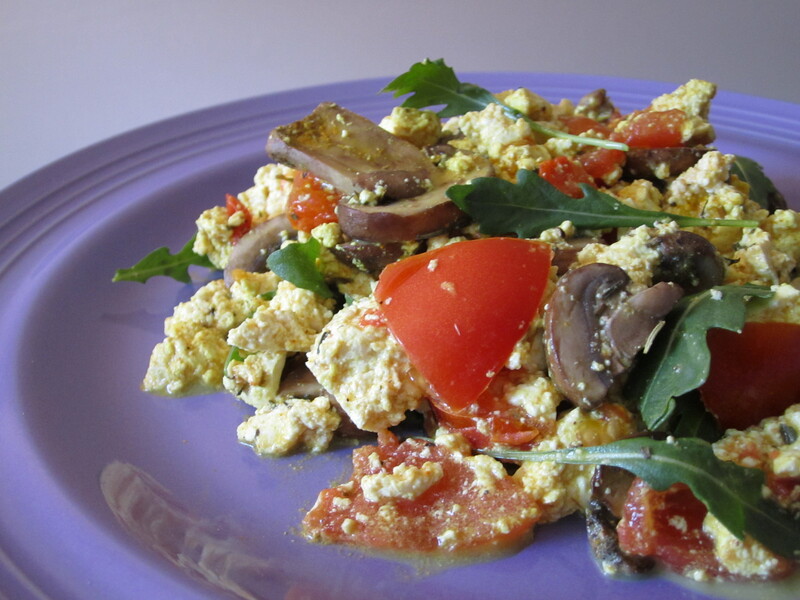 You might think, what’s so special about a tofu scramble? But if it’s made well…ahhh. Hearty and heavenly. I’ve cooked tofu scramble before. But after eating the Arugula, Mushroom and Tomato Tofu Scramble from my fave vegan brunch hotspot True Bistro (seriously amazing brunch including THE best vegan Bloody Marys ever), I knew I had to replicate it at home. After hearing of its sulfurous taste mimicking that of eggs, I’ve been on an arduous journey to find black salt. Could I have ordered it online? Sure, but where’s the fun in that! After stumbling upon black salt in a culinary store in Connecticut, I knew I had to put it to use. I drew inspiration from True Bistro with the fresh arugula and Herbs de Provence (I feel like I’m in the French countryside!) as well as from my tofu scramble (which I adapted from Happy Herbivore in Vegetarian Times) along with the recipe from the Candle 79 Cookbook. With its vibrant colors and textures and flavors — the peppery arugula, earthy mushrooms, fluffy tofu, fragrant Herbs de Provence — your tastebuds will awaken and you’ll be able to tackle anything the day throws your way. 1. Remove tofu from package and drain. Press tofu for 30 minutes. Then crumble into pieces. Set aside. 2. In a large skillet, heat olive oil. Add mushrooms and saute until golden, roughly 5 minutes. 3. Add tofu, tomato, broth and nutritional yeast. Stir. 4. Then add mustard, butter, Herbs de Provence, and turmeric. Stir. 5. Cook for about 5 minutes. 6. Remove from heat. Add arugula, black salt and black pepper. Stir and serve. Serves 2-3 | Bon appetit! Tags: breakfast, brunch, food, recipe, tofu, tofu scramble, vegan. Bookmark the permalink.